Dr. MARK LEUCHTER: Who were the Levites? (TheTorah.com). The Torah describes the Levites as a landless Israelite tribe who inherited their position by responding to the call of their most illustrious member, Moses, to take vengeance against sinning Israelites, but this account masks a more complicated historical process. I first learned the theory from my teacher Frank Moore Cross that the Israelite priesthood goes back to competing groups who traced their genealogies back, respectively, to Moses and Aaron. It is admittedly speculative, but it seems to have some explanatory value for untangling the very complicated traditions in the Hebrew Bible about the priesthood. THE ANXIOUS BENCH: Mixing and Merging Languages (Philip Jenkins). One thing that makes me feel very much at home in Texas is the way people talk Spanish. To explain, I did not grow up in a Spanish speaking area, but the way Latino people navigate between languages reminds me so precisely of the sort-of bilingual environment in which I spent my childhood. Thinking about that world has taught me a lot about how people through history have operated in in such societies. And to introduce a very large topic to which I will return in other posts, you see these processes very much at work in ancient languages and texts, including the New Testament. The Book of Revelation, above all, should be retitled the Book of Linguistic Interference. I look forward to future posts in this series. Cross-file under Philology. THERE'S AN APP FOR THAT: New WhatsApp Group Using Alerts to Catch Antiques Robbers (JNi.Media). According to Malachi Yizre’eli, a volunteer coordinator for Guards of Eternity, the group is calling on Israelis who spot an archaeological site that had been robbed or vandalized to send a WhatsApp to 055-666-6486 and report the site’s name, its GPS coordinates or its Google pin, the caller’s name and phone number, a description of the violation and, most important: images and videos of the site and, if possible, the criminals in action. Cross file under Looting and Technology Watch. NEWS YOU CAN USE: The History of Judaism (SESAN SAMUEL OYEDEPO, techfeatured). This essay starts with Abraham and goes up to the beginning of the twenty-first century. I can't vouch for every detail, and there's a lot of rounding off and simplification, but it looks substantially accurate. READING ACTS: Resources for Studying the Second Temple Period. One small correction: the earliest complete text of 2 Enoch is the Church Slavonic version, but there are also fragments (discovered in 2009) of a Coptic version in a manuscript that dates from the 8th to the 10th centuries CE. Both the Slavonic and the Coptic were presumably translated from a Greek Vorlage. I would also add the relevant ancient inscriptions in Hebrew, Aramaic, Greek, and Latin to the list. Past posts in Phil Long's new series on the Second Temple Period are collected here. For Phil's earlier series on 2 Enoch, see here and follow the links. And for some past PaleoJudaica posts on 2 Enoch see here and links (cf. here and here). ZOHAR WATCH: WHY TRANSLATE THE ZOHAR? (A Q&A) (Jodie Shupac, Canadian Jewish News). Joel Hecker is a leading scholar of Jewish mysticism and an associate professor at the Reconstructionist Rabbinical College in Wyncote, Penn. Hecker is part of a team that together has spent nearly two decades working on a new English translation of the Zohar, a landmark project that produce the first unabridged translation, with commentary, of the original Aramaic text. Hecker visited Toronto last fall and spoke about Kabbalah and the Zohar at Makom: Creative Downtown Judaism. The CJN spoke with him by phone. What’s been your role in the team of translators? The primary translator was Prof. Daniel Matt. He started work on this 18 years ago and was working on the project full-time until about seven years ago, when the project’s sponsors, Margot and Tom Pritzker of Chicago, decided they wanted it finished before 2022. They hired two of us to do the last three volumes. Danny completed translating through Volume 9, and myself and Nathan Wolski, an Australian scholar, split the last three volumes. I’m dealing with copy editing now at the end of Volume 12. So Volume 12 will be published in May. Each volume is being published individually. They started to be published in 2004 and have, on average, come out every one to two years. Why translate it into English? Because it’s the most important text in the mystical Jewish tradition. It’s a value to spiritual seekers both Jewish and not. Until now, the Zohar has been largely restricted to academic or religious scholars. With the richness and spiritual creativity you find here, it’d be a shame to limit it to such an elite and exclusive few. For past posts on the Zohar, Joel Hecker, and the Pritzker/Matt Zohar translation project, start here and follow the many, many links. MOSUL CAMPAIGN: The Fate of Iraq's Indigenous Communities (Ramsen Shamon, Fair Observer; rprt. AINA). Remember who the US military first aided when American warplanes joined the battle against the Islamic State (IS) in 2014? It wasn't the Iraqi government. It was a religious minority known as the Yazidis, who were stranded and surrounded by the terrorist group on Mount Sinjar in northern Iraq. Now, the fight to wrest control of Mosul from IS has the world fixated on Iraq's second largest city--and the uncertain fate of its remaining inhabitants caught in the crossfire. But the city's indigenous minorities, including Yazidis, Assyrians and a variety of other small sects who consider the area their ancestral home, have already been kicked out for not submitting to the Islamic State's radical version of Islam. And they have been largely forgotten. Their only means of survival in the ethnic and sectarian cauldron that will likely remain for years to come may be the establishment of an autonomous region inside Nineveh Province, similar to what currently exists for the Kurds. "Since 2003, we have been struggling because of the conflict between the big [players] in Iraq. They are fighting for our lands in Nineveh, without even counting us as the original people of this area," says Athra Kado, an Assyrian teacher and soldier with the Nineveh Plains Protection Unit, a fighting unit safeguarding local communities against Islamic militants in northern Iraq. "Our people and other minorities are asking for a province, Nineveh Plains Province, and that is the first step for having our own autonomy--to have our own economic percentage as any other province in Iraq. And to have our own forces in the area." January 2017 Volume 1 Issue 1 (ed. Jason von Ehrenkrook). With information on upcoming Enoch Seminar events and links to the latest book reviews. TRAVEL: 18 Must-See Sites in Israel (Brandon Marlon, Jerusalem Post, One of the People Blog). There are many more than eighteen such sites in Israel, but this list is a good start. Many of the sites on it are relevant for the study of ancient Judaism. SHAI SECUNDA: Why the Talmud is the Only Rabbinic Work from Babylonia. The Babylonian Talmud as an Oral Library for Rabbinic Collections (TheGemara.com). In late antiquity, rabbinic Jewry was divided into two centers: Galilee and Babylonia. It is surprising that only one rabbinic work, the Babylonian Talmud, was produced in late antique Babylonia, while numerous compilations, including the Mishnah and the Tosefta, several Midrashei Halakha as well as Midrashei Aggadah, were compiled in Roman Palestine. How might we explain this disparity? According to Professor Secunda, the Babylonian Talmud was orally transmitted, and not written down, all the way through the Geonic period, i.e., through the tenth century C.E. I mentioned this idea awhile ago and got some skeptical e-mail about it. Professer Secunda, who is a specialist in Talmud, explains some of his reasoning in this essay. Maggie L. Popkin, The Architecture of the Roman Triumph: Monuments, Memory, and Identity. New York; Cambridge: Cambridge University Press, 2016. Pp. xiv, 271; 8 p. of plates. ISBN 9781107103573. $99.99. Popkin’s new monograph on triumphal architecture along the triumphal route consists of 4 main chapters, plus an introduction, a conclusion, and an appendix (no map of the route is provided). The book is part of a recent outpouring of research on the Roman triumph, with much of this attention focusing on the rules and conventions determining the awarding of triumphs, as well as the spectacle in Rome itself. 1 The book proposes to look at three critical periods: the Punic Wars, the reign of Trajan and that of Septimius Severus. Cross-file under Punic Watch. The Jewish Triumph procession in 71 CE after the defeat of the Great Revolt against Rome also receives some attention. You can read the account of the latter by Josephus here. That Triumph procession is memorialized on the Arch of Titus. ANCIENT JEW REVIEW: Book Note | The People Beside Paul: The Philippian Assembly and History from Below (Jennifer Quigley). YESTERDAY, BUT I WAS PREOCCUPIED WITH BURNS NIGHT: The “Conversion” of Paul (Larry Hurtado). Today (25 January) in the traditional ecclesiastical calendar marks the Feast of the Conversion of Paul, who is likely the most famous “convert” in religious history. He remains a giant figure in the study of Christian origins, with scholarly books on him continuing to pour out of the presses. He is also perhaps the most controversial figure in early Christianity. Accused by some of being the true founder of “Christianity,” and even of perverting Jesus’ teachings, accused by others of being a misogynist, in traditional Jewish thought accused of being the arch-apostate, in his own lifetime accused of teaching a libertine way of life, seen by others as a spiritual father-figure and paradigmatic teacher of Christian faith, a doughty defender of what he believed to be non-negotiable convictions, he remains fascinating as a human subject. Mary the Jewess, a.k.a Maria the Jewess, Mary the Prophetess, or Miriam, truly is the First Lady of Hooch. Many of the details of Mary’s life have been lost to history, but thanks to the 4th century Gnostic Christian writer Zosimos of Panopolis, who wrote about Mary’s groundbreaking work in Peri kaminon kai organon (On Furnaces and Apparatuses), we can be confident that she essentially invented the still. Mary lived around 200 CE and has been credited with the invention of several chemical instruments, one of which is the tribikos (a type of alembic still). The goal of her early still was non-boozy: Mary was attempting to master the art of making gold from base metals. She is considered to be the Western world’s first true alchemist, and today, while we aren’t trying to turn lead into precious gold, her work helps us turn base materials like corn and water into… whiskey! A model of her device is still used in some parts of Europe to make brandy and whiskey. It’s used in America, too, often to make moonshine. There's more on Mary the Jewess (Maria Hebraea) or Mary the Prophetess (Maria Prophetissa) in this rather technical Jewish Encyclopedia article by Moses Gaster or this more accessible popular essay at the History of Alchemy website. The bottom line is that she is first mentioned by the alchemist Zosimus of Panopolis around 300 CE; she may or may not have been a real person; and if she was real, we don't know when she lived except that it was before Zosimus. As the quote above indicates, she didn't distill whisky, but she did reportedly invent some of the technology that would in due course lead to whisky distilling. Here is an unattributed account of The practise of Mary the Prophetess in the Alchymicall Art at the Sacred Texts Archive. "A little after 1700, the Campbells of Jura drove away an old prophetess, despite the fact that she was renowned for her wisdom. By way of revenge, she foretold that the last Campbell would leave the island destitute and blind in one eye, with his few belongings in a cart pulled by a single white horse. The prophecy came true in 1938, when Charles Campbell, having lost the sight of one eye in the First World War, fell on hard times and led his white horse down to the pier for the last time. Like Jura itself, Prophecy is a whisky impregnated with such stories: each drop recounts a different legend." That's all I have been able to find about her, but I'm planning on visiting the Isle of Jura this summer, and I will report back on any local legends I encounter there. Meanwhile, there you have it. Two prophetesses and a fine single malt for Burns Night. Sláinte! And remember to be nice to prophetesses. THE ASOR BLOG: Good Public Relations: What Persian Propaganda Tells Us About the ‘Nehemiah Memoir’ (Lucas Schulte). Stretching from Egypt to the Indus River, the Persian Empire was the largest empire yet seen in the ancient Near East. Typically, the Hebrew Bible depicts ancient Near Eastern empires as divine instruments of punishment. But the Persian Empire is an exception: the Persians allowed Judean exiles to return home and rebuild the Jerusalem temple, so the Hebrew Bible uniquely depicts their empire as expressing YHWH’s benevolence. These positive depictions of Persian kings provide a better understanding both of the development of the book of Nehemiah and the Persian context behind it. Everyone needs good PR, even empires. DR. JASON MOKHTARIAN: Concluding a Tractate with King Shapur’s Praise and Practice of Rabbinic Law (TheGemara.com). Dr. Amitai Mendelsohn investigates the various appearances of the figure of Jesus in Israeli art as a significant, multifaceted and ever-present phenomenon. Through works by prominent artists from different generations, it discusses in depth the evolving attitudes of Jewish, Zionist pre-state, and Israeli art towards Jesus, from the second half of the nineteenth century until today: from artists laboring "In the shadow of the Cross" to artists who saw Jesus as a symbol of the rebirth of the Jewish people in the land of Israel, and artists whose engagement with Jesus is detached from the complex and fraught relations between Christianity and Judaism, and who see him as symbolizing the suffering artist. The book examines the different directions taken by Israeli artists in portraying the figure of Jesus, and proves the extent of this phenomena and its ever present importance. Although, oddly, the publisher's blurb never says this, this book is clearly the catalogue for the Behold the Man exhibition currently running at the Israel Museum. Aviya Kushner reported that it is being translated into English. THIS WEEK'S DAF YOMI COLUMN BY ADAM KIRSCH IN TABLET: What the Rich Owe the Poor. In this week’s ‘Daf Yomi,’ the deep Jewish roots of income equality, and the shared dignity it brings. María José Martín-Velasco, María José García Blanco (ed. ), Greek Philosophy and Mystery Cults. Newcastle upon Tyne: Cambridge Scholars Publishing, 2016. Pp. xii, 244. ISBN 9781443888301. £47.99. The nature of Greek culture makes it possible to publish a book with a title announcing what would be a contradictio in terminis when dealing with other cultures. But it is a crucial theme in the history of Greek philosophy and this is why we must celebrate the publication of a volume like this one in which some of the most relevant questions suggested by the title are dealt with, offering interesting analyses and proposals. It is a collection of the lectures presented at a meeting of the Iberian Society of Greek Philosophy held at the University of Santiago de Compostela in May 2012. There's nothing specific on ancient Judaism, but much of the subject matter mentioned is of potential background interest. GOOD NEWS FOR ACADEMIC JEWISH STUDIES: UC Santa Cruz launches Murray Baumgarten Endowed Chair in Jewish Studies. Over 150 donors commit nearly $1 million to support research, teaching, and public events (Scott Rappaport, UC Santa Cruz News). Over 150 donors have committed a combined total of $977,130 to establish the new Murray Baumgarten Endowed Chair in Jewish Studies in the Center for Jewish Studies, located in the UC Santa Cruz Institute for Humanities Research. The purpose of the chair is to promote research, teaching, and public outreach activities in the area of Jewish Studies. Nathaniel Deutsch, director of the Center for Jewish Studies, was honored as the inaugural chair holder at an investiture ceremony held yesterday on campus at College Nine and Ten. A professor of history, Deutsch is also director of the Institute for Humanities Research at UC Santa Cruz and the chair of the University of California Consortium of Humanities Centers. Professor Deutsch has published on, inter alia, Mandaeism (Mandeism), Gnosticism, and Merkavah Mysticism. He has been mentioned by PaleoJudaica a couple of times here and here. Congratulations to him, to Professor Baumgarten, and to UC Santa Cruz. ARCHAEOLOGY: Ruins discovered near Sea of Galilee could be rare medieval synagogue (Cheyenne Macdonald, Daily Mail). Archaeologists have unearthed what could be the ancient remains of a synagogue in a village near Israel’s Sea of Galilee. It was built during the 12th and 13th centuries, and incorporates parts of a fifth-century Roman synagogue known to contain stunning mosaics. The placement of benches along the east, north, and west walls suggests that the ancient structure is a synagogue – but researchers say such a find is extremely rare in this setting, given the lack of a Jewish presence in the area at the time. The Middle Ages are usually outside PaleoJudaica's realm of interest, but I note this story because the medieval ruins, whatever they are, are closely associated with the ruins of the late antique synagogue at Huqoq. For much more on the many ancient ruins etc. at Huqoq, start here and follow the links. In this book von Wahlde provides an exploration of three distinct cultural and religious backgrounds against which scholars have frequently proposed that the Gospel and Letters of John are to be read and understood. von Wahlde examines each of these three possibilities in turn, and shows how they may be regarded as plausible or implausible depending upon the evidence available. von Wahlde shows that there are features within the Gospel and/or Letters of John that do in fact suggest that they were influenced either by Gnosticism, Docetism or one of the variant forms of Judaism. However, in each case, while some of the evidence suggests a particular background, von Wahlde shows that it is equally evident that not all of the evidence can be seen to suggest the same background. Through an examination of the origins and purpose of the gospel, and drawing on the conclusions of his well-regarded commentary on the Johannine literature, von Wahlde presents a new way of understanding the Gospel in its wider contexts. This was published in 2015 but it only just came to my attention. With respect to the arrival of this new star in 2022, there is no doubt that it is a significant moment for astronomers and physicists. As far as Berger’s prediction’s go, other scholars are unconvinced. Joel Baden, a professor of Hebrew Bible at Yale Divinity School, told me that this interpretation of the prophecy from Numbers is problematic because, grammatically speaking, the star doesn’t “rise”—it literally “treads,” as one would when crushing grapes. Furthermore, while Berger is in good company, it’s unclear why he thinks that the star in this verse is a literal star while the scepter is a symbol for a ruler. The two images are parallel to one another, Baden told The Daily Beast, so why not read them in the same way? Balaam's prophecy doesn't really have any obvious connection to the forecasted 2022 event. It doesn't say "The collapsing mutual orbit of a binary star pair will cause a red nova and then the Messiah will come." I might be impressed if it did, but it doesn't. In comparison, "A star will come out of Jacob" is pretty ambiguous. BOOK REVIEW: Book Notice: Basics of Classical Syriac (Euangelion Blog). Steven C. Hallam has taught Hebrew, Greek, Aramaic and Syriac at a graduate level. He has written a clear and practical text welcoming new students into the Syriac language. Syriac is a dialect of ancient Aramaic, and is similar in basic structure to Aramaic as well as having many similarities to Hebrew. The book is written for those who have not studied Hebrew or Aramaic. Hallam encourages the reader to take Syriac on its own terms. However, students who are familiar with Hebrew or Aramaic will find the grammar easy to access. I noted the book here when it was published last year. THE TRUTH IS IN THERE: The truth is in the garbage: New research examines ancient Roman trash (Traci Watson, USA Today). When workers began digging out the Roman cities torched by Mount Vesuvius, the exquisite wall paintings, sumptuous villas and golden jewelry they found quickly grabbed the spotlight. But archaeologists are now looking to a less glamorous feature of these cities: the garbage. Over the last few years, a team of researchers has taken a systematic look at street trash, buckets and even storage containers from Pompeii and other ruins to understand the relationship between ordinary Romans and their stuff. The extraordinary preservation of objects by volcanic debris allows for extraordinary insights into humdrum possessions, the researchers say. There's nothing specific about ancient Judaism in this article, but the basic principle — that ancient people's trash preserves important information for historians — is widely applicable. 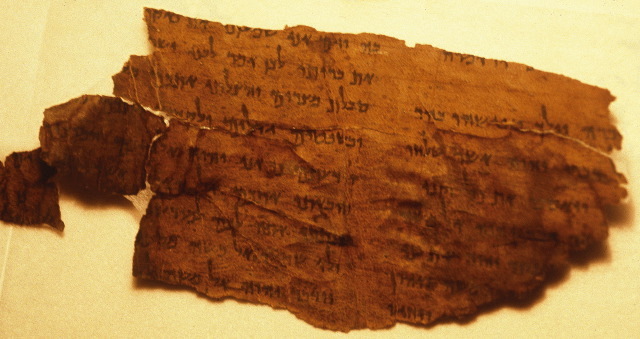 A couple of premier examples for our purposes are the Cairo Geniza and the Oxyrhynchus papyri (on which more here and here and many links). But there are endless more mundane examples like the Pompeii project. This analysis of day-to-day trash contributes much our knowledge of details that we would otherwise never have known. Who is carrying the Temple menorah on the Arch of Titus? STEVEN FINE: WHO IS CARRYING THE TEMPLE MENORAH? A JEWISH COUNTER-NARRATIVE OF THE ARCH OF TITUS SPOLIA PANEL (Academia.edu). The Arch of Titus, constructed circa 81 CE under the emperor Domitian, commemorates the victory of the general, then emperor Titus in the Jewish War of 66–74 CE. Located on Rome’s Via Sacra, the Arch has been a “place of memory” for Romans, Christians and Jews since antiquity. This essay explores the history of a Jewish counter-memory of a bas relief within the arch that depicts the triumphal procession of the Jerusalem Temple treasures into Rome in 󰀷󰀱 CE. At least since the early modern period, Jews—as well as British Protestants—came to believe that the menorah bearers of this relief represent Jews, and not Roman triumphadors. This essay addresses the history of this widespread belief, particularly during the nineteenth and twentieth centuries, and continuing in contemporary Israel. This is an offprint from a 2016 Brill publication, but I can find no further details. For past posts on Professor Fine's recent book, The Menorah see here and follow the links. They (plus here and here) also lead to many past PaleoJudaica posts on ancient menorahs in general. And the bottommost photo in this post shows the menorah panel in the Arch of Titus. AWOL: Chester Beatty Papyri at The Center for the Study of New Testament Manuscripts (CSNTM). These include Septuagint manuscripts, manuscripts of Old Testament Pseudepigrapha in Greek (1 Enoch, Jannes and Jambres), and New Testament manuscripts and lectionary fragments in Greek, Armenian, and Latin. Past PaleoJudaica posts on the Chester Beatty Library are here and links. I am very much looking forward to seeing the Library for myself at the annual meeting of the British New Testament Conference, which takes place at St Patrick's College in Maynooth, Ireland, in September of 2017. Cross-file under Technology Watch and Digitization. For many other manuscript digitization projects, start here and follow the links. YONA SABAR: Hebrew Word of the Week: ‘almah "young woman, maiden, marriageable girl; missy." With the obligatory foray into Isaiah 7:14. That catches us up with relevant Hebrew Word of the Week columns for now. John Granger Cook, Crucifixion in the Mediterranean World. Wissenschaftliche Untersuchungen zum Neuen Testament 327. Tübingen: Mohr Siebeck, 2015. Pp. xxiv, 522. ISBN 9783161537646. €69.00 (pb). This massive study aims to fill a longstanding gap in an area where both Classics and New Testament Studies operate. Professor Cook was invited by the late Martin Hengel, author of a 1977 monograph on the subject, to revise it for him—but Cook soon concluded that he should write his own book, which far surpasses Hengel's 99-page work. The book, among other things, collects references to crucifixion in Latin, Greek, Hebrew, and Aramaic texts. Gruesome.